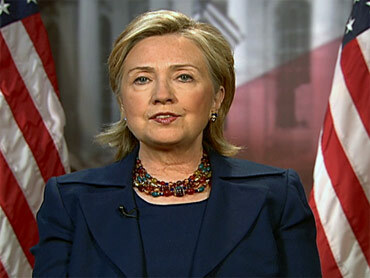 Secretary of State Hillary Clinton will travel to Haiti tomorrow to review the United States' ongoing relief efforts. Clinton will travel with Dr. Rajiv Shah, administrator of the United States Agency for International Development (USAID), the secretary announced today. They will meet with Haitian President Rene Preval and other members of the Haitian government, as well as U.S. civilian and military leaders guiding the relief efforts from Haiti. "We will also be conveying very directly and personally to the Haitian people our long term, unwavering support, solidarity and sympathies to reinforce President Obama's message that they are not facing this crisis alone," Clinton said. "I will also be able to see firsthand the ongoing efforts and deployment of U.S. government personnel and resources for maximum impact to support the vital lifesaving relief and recovery efforts." Clinton announced today that the American Red Cross, with the assistance of the State Department, has raised more than $10 million from more than one million donors via its SMS Haiti Relief Campaign -- the largest mobile donation campaign ever. She also announced a new online tool through which people can search for missing persons in Haiti. The tool is available at www.state.gov/Haitiquake.